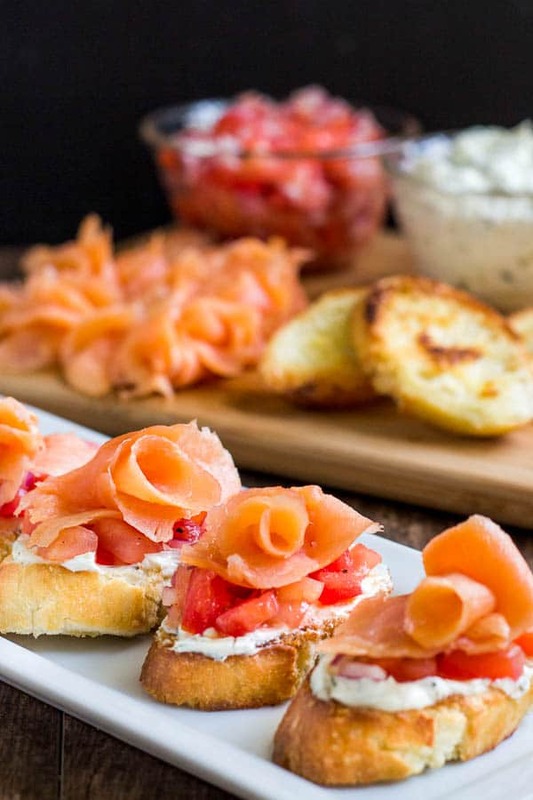 These smoked salmon crostini are simple to make, but complex in taste and texture. Quick and impressive appetizer in less than 30 minutes! Boy, do I love smoked salmon! If you’ve been reading my blog for a bit, you know how much I adore smoked salmon. Seriously, type in smoked salmon in the search box up on top, and see for yourself. I love it because 1. it’s simply delicious! 2. They add a fancy touch to just about any dish. Today, we’re dressing up delightful little bites of toasted baguette topped with zesty herby cream cheese and fresh tomato relish. Everything in this recipe compliments each other. Crispy crostini pair beautifully with buttery texture of salmon. Creamy filling infused with capers and dill is soft and doesn’t overpower the delicate salmon flavor. And tomato relish adds freshness to every bite! 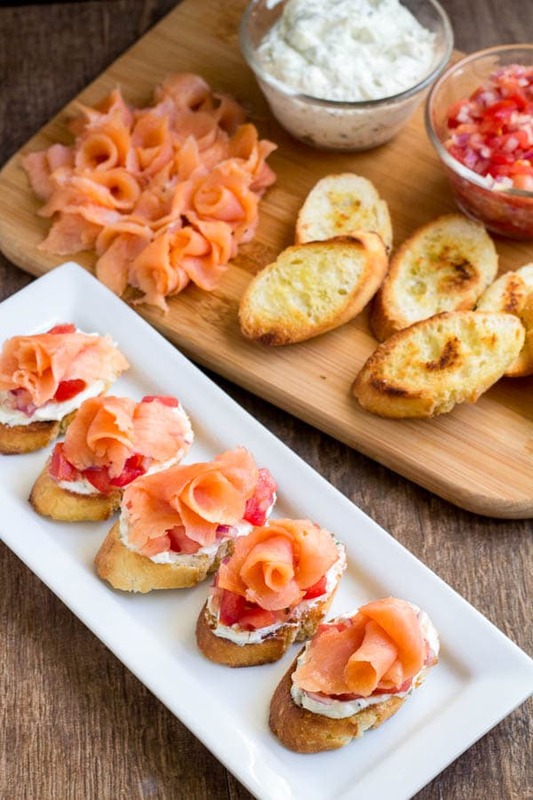 These smoked salmon crostini are by far one of the best crostini recipes! But what is crostini, you ask? They are basically small slices of bread, usually baguette, toasted with some olive oil and topped with different veggies, meats, or whatever you heart desires. Actually, topping is optional! Seasoned with simple salt and pepper, plain crostini are just as good. Basically, crostini = small Italian toasts. What’s bruschetta then? Well, bruschetta is also a toast, but bigger in size. Think rustic Italian bread, sliced into large toasts. Crostini, on other hand, are made of small, thin slices of fine-textured bread, like baguette. 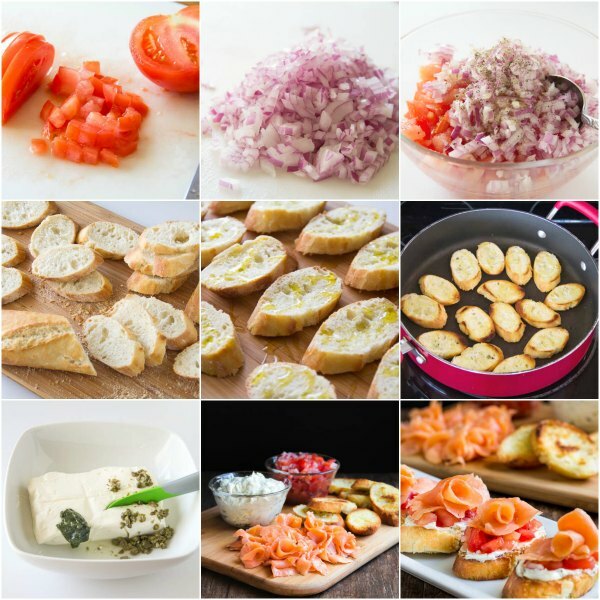 Dressed up with various toppings, crostini are an absolutely perfect appetizer for any occasion! The best part is you can make everything in advance, and put them together right before serving. Or better yet, let your guests assemble their own crostini. And here are the step-by-step photos how to make crostini. As I mentioned earlier, you can prepare everything a day in advance. Assemble the crostini right before serving, or lay out everything on a platter for your guests to assemble it themselves. To make tomato relish, in a medium bowl, mix together chopped tomatoes, chopped red onion, salt and pepper. Let stand for at least 15 minutes to marinate. To make filling, in a separate bowl, combine cream cheese, lemon juice, capers and dill paste and mix until well combined. To prepare the toasts, slice the baguette into thin slices and drizzle with olive oil. Warm up a large skillet and toast the bread slices on each side until nice and toasty, about 2 minutes on each side. 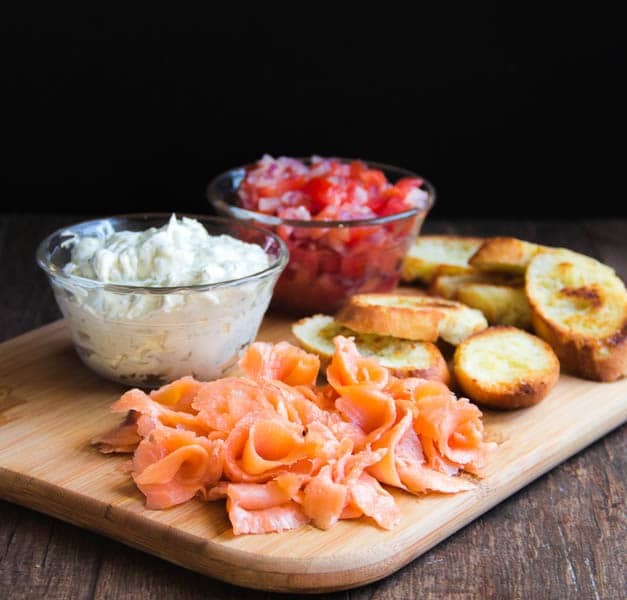 To assemble, spread the cream cheese filling on toasts, and then top with tomato relish and smoked salmon. 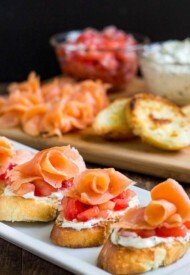 OR you can serve toasts, tomato relish, cream cheese filling and smoked salmon separately on a platter. Make-ahead Tip: You can make toasts, tomato relish and cream cheese filling a day in advance. Store the cream cheese filling and relish in the fridge. Toasted bread will keep well in an air tight container. This recipe was originally published on October 13th, 2014.